Slipper Orchid pouches attract a lot of attention around here from our visitors. And so, from the Department of Frequently Asked Questions comes: Are Lady's Slipper Orchids carnivorous? Is the pouch a trap? 'No' and 'Sort of' are the answers. That glossy bubblicious pouch, actually a modified petal, is a trap for insects, but the trap has a different function from the traps of insectivorous plants. The pouch is just one of the parts of a pollination mechanism, a reproductive process in which a successful outcome is pollination, not nutrition. And the insect is the messenger, not the meal. 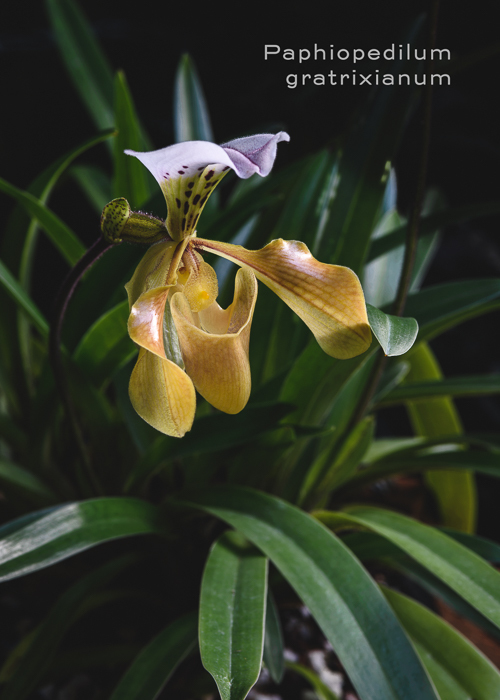 Paphiopedilum gratrixianum, a tropical Asian slipper flowering now in the Orchid Center, is an example. Tropical slipper orchids are thought to be pollinated by flies, though most of the evidence is indirect. 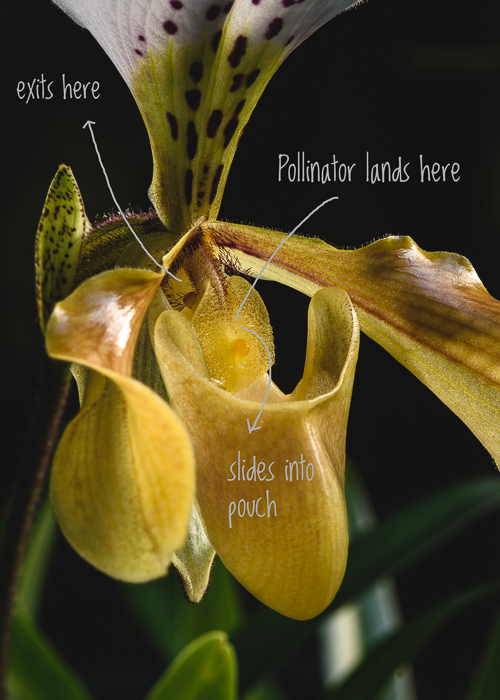 There simply aren't a tremendous number of field studies documenting slipper orchid pollination. 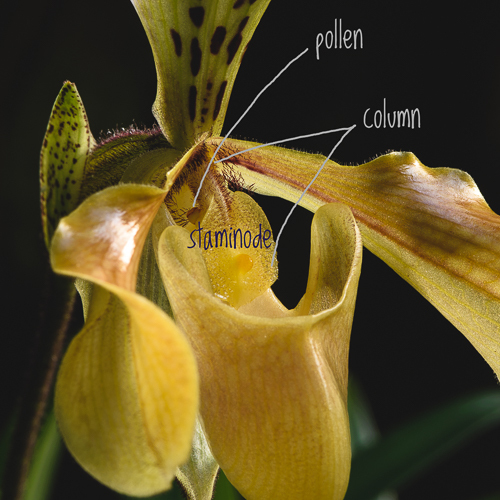 So, although I don't know exactly which insect pollinates Paphiopedilum gratrixianum, it's possible to make a fair guess, based on a study of a closely related species, Paphiopedilum villosum. A field study (Bänziger 1996) of P. villosum reported pollen capture by hover-flies and the author suggested that the hover-flies are lured by food deception. The shimmering staminode (the flattened end of the column) in the center of the flower appears to mimic the sugary honeydew secretions of aphids. To a hover-fly, it holds the prospect of a meal. Something nutritious and delicious. But, no, it's simply a slippery surface, and the hover-fly falls into the pouch. The margins of the pouch (above) are rolled inward and prevent the fly from taking wing. To escape, the fly has to climb the scaffolding of hairs behind the column where the pollen is located. The pollen sticks to the back of the fly as it emerges near the base of the column. The fly receives nothing that it can use, no supper, just a enormous blob of pollen that can be deposited at the next slipper orchid offering a fake meal. Pollination using a food lure (real or fake) is a fairly common mechanism across the plant kingdom and involving different types of pollinators. But in orchids, the anatomy for deception and manipulation of winged insects has evolved to an extraordinary degree. Yes, the pouch is a trap, but in the same way that the bucket of a Coryanthes flower is a trap. It's a trap that facilitates pollination. I once found a hoverfly caught in a Paph hybrid on display in Florida. I snapped a photo if you are interested. Hope the plants for Orchid Daze have arrived in good condition.